So, yes, I have a new favourite sleeping pack, the fact that it contains donkey milk should come as a surprise to no one. Camel milk, donkey milk, goat milk, give my skin all the milks. Milk baths for beauty date back to antiquity, Cleopatra herself was said to have bathed in donkey milk for supple skin. 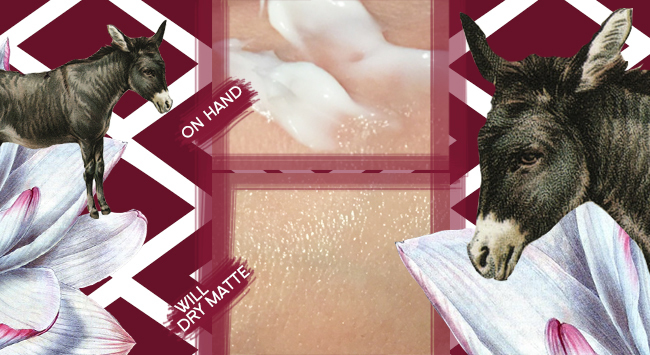 In terms of ingestion, donkey milk is said to be closer to human breast milk than anything else, so the vitamin and fat content is very high, that’s good news for your skin. 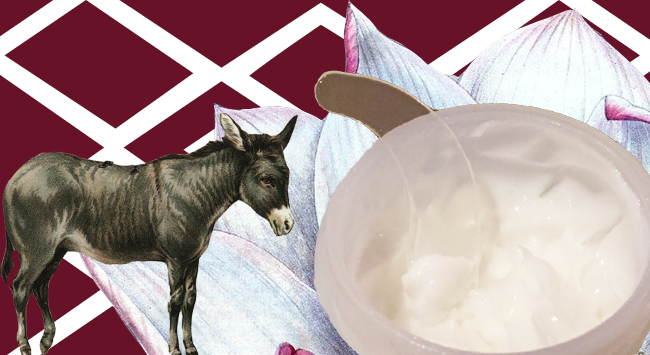 Some of the vitamins present in donkey milk are vitamins A, C, B, B12, as well as Omega 6. So much goodness, it’s no wonder people are clambering for it as a skincare ingredient all over Asia. I’m right behind them. 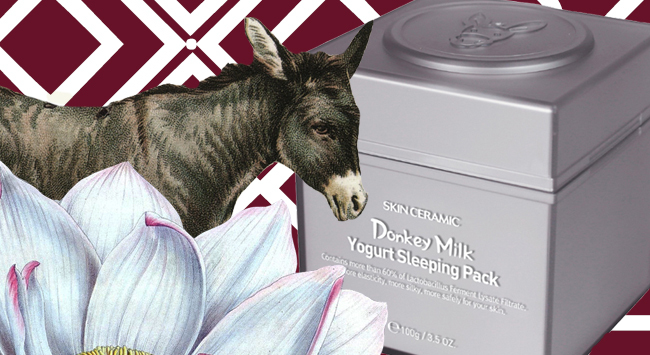 The Skin Ceramic Donkey Milk Yogurt Sleeping Pack, in addition to the obvious and wonderful donkey milk inclusion, also features skin favs such as hyaluronic acid, green tea extract, niacinimide, propolis extract, yogurt extract, aloe vera extract, as well as a hefty dose of lactobacillus ferment lysate filtrate. What more could you ask for? This is like health food for your skin! And it preforms as such too. You’d think that given all that’s packed into this cream, it might give a slick shiny sheen to your skin, and while it does at first, it does dry down almost completely matte. So if you wanted to use this under makeup for daytime use, I don’t see why you couldn’t. I have with no problem. The texture is exceedingly light considering all the yummy ingredients. I was almost afraid it wasn’t going to work like I had hoped when I first tried it on. It’s very smooth and not sticky in the least little bit. It provides an excellent barrier moisturizer at night and you will wake up with plumper, more hydrated, happier skin. Now, I say all of that as a drier skinned person, but my husband the oil machine (and my constant oily skinned guinea pig for products I’m testing) also enjoyed benefits from this sleeping pack. His skin was less oily than normal in the morning and had that bouncy “tchok tchok” look and feel without all the grease. This is a wonderful sleeping pack and retailing at under $40, you get a very generously sized portion at 100 grams. The sturdy square plastic packaging and included spatula are also a welcome addition to the overall appeal of this pack. This is definitely a must try product, I’ve repurchased this twice so far, and that’s saying a lot for me and my ever rotating skin wardrobe. I’m holding off on the holy grail label as of yet because I have a few very promising sleeping packs to try out next, but this is as close to perfect as I can imagine so far! Give this pack a try, your skin will thank you!